Many years ago in The Grantmaking Tango I wrote that funders get the voluntary sector they deserve, and decades later that rather provocative phrase has been ringing in my ears. What I meant then was that short-term project funding, the hunt for innovation, the emerging contract culture, and the focus on delivery and outcomes were shaping a sector that was itself sometimes insufficiently thoughtful, had too little capacity to plan and frequently struggled to get its voice heard. So much has changed since those days and the relationship with funders, both statutory and charitable, has changed beyond recognition. But the central question remains. The world is changing fast, and anyone engaged in the work of moving money into and around civil society needs to consider whether the ways in which they do this are helping, or hindering, the development of a genuinely connected, pluralist resilient sector. In our one year report for the Civil Society Futures inquiry we have found civil society that is active, engaged and imaginative – and yet often feels overlooked and ignored. A civil society which contains within it deep divisions, in which there is a gulf especially between small local groups, and the big charities. As one person working with smaller organisations at the Devon Community Foundation put it, “The phrase ‘below-the-radar’ is misleading, as they are often at the centre of local communities, just not visible to officials and policymakers”. And we’ve heard from a number of organisations of all sizes that they feel both challenged and stimulated by the new networks and movements, and the more informal emerging activities within civil society. The world is changing at internet speed – will we keep up? Central to what we’ve heard is that the big aspiration for the future of civil society in the coming years is to generate a radical and creative shift which puts power in the hands of people and communities. “I’d love to be in a place where we have joint decision making, where we co-produce things, co-deliver things,” said one of the participants at our Oldham community workshop. It’s a deep-rooted desire to find new forms of democracy in every area of life, as a creative response to everything from inequality to racism to technology, to prevent an ‘us and them’ future, connect us better and humanise the world we live in. Shaping everything from local communities to charities to the work of the future. There are some great examples of funding organisations experimenting with new models and approaches to doing this – including Edge Fund, Big Local, Lankelly Chase, the Marine CoLab’s approach (ignited by Calouste Gulbenkian) to bring together the ecology of support around Marine Protection, and the Baring Foundation’s own LGBTI rights programme in sub-Saharan Africa to mention a few. In an age of declining trust and increasing demands for involvement and accountability, how can you help today’s organisations transform to put more power with people and communities? In an age of #metoo, how can you help tomorrow’s networks and movements emerge? How could funders themselves model alternative ways of organising? What might the new models of membership, participation, governance and accountability be for funding organisations? Who is doing this well today and what can we learn from them? Does every decision shift power, or further entrench it? What is measured and valued? What isn’t and needs to be? Where does the intelligence and knowledge come from? There are no easy answers. This requires all of us to search deeply for the changes we must make. But independent funders have huge market power – matched with courageous creativity, it has a potential richer than any figure in pounds and pence. Funders can model the sort of change they wish to see, they can support the organisations who are doing it, invest in change, and recognise the shifts in power that are so central to the future. In doing so they can be at the heart of civil society’s future. 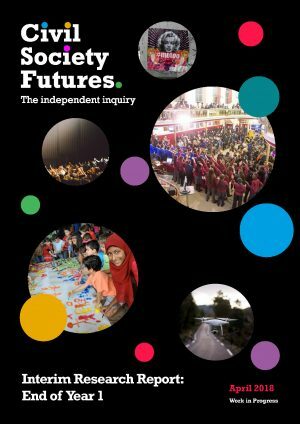 In our second year of Civil Society Futures we want to work with funders of all sorts to ensure that civil society – in which they are such an important part – is fit for purpose in a more complex, more challenging but very much more exciting future. I hope you will be part of it. Julia is the Chair of the Inquiry into the Future of Civil Society – Civil Society Futures, a two-year project funded by a group of independent foundations, including the Baring Foundation, to explore the future shape and role of civil society in England. A full report and a summary of findings after Year 1 of the Inquiry.